If you know ShinChan only through the Adult Swim television series, you might be surprised how great this movie is. I know I was. 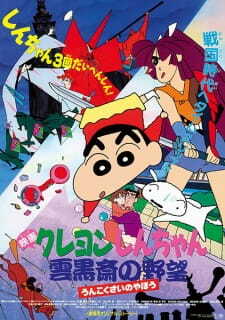 In this movie, Shinchan and his family have to go back in time to help Fubukimaru save his (her?) sister from a deviant time traveler. Because of this, the movie deviates early on from the usual scatological humor of the tv show into an epic samurai action flick, with Shinchan mostly along for the ride. Don't be turned off by the art style. The lack of details in the characters allows for a fluidity of animation that is rarely seen in anime movies.The movie starts off slow, but the middle of the movie in particular is one extended castle-raid, which is one of the best action scene I've ever seen in anime. And just as you think everything is over, a twist reveals that time travel is much more complicated than you think. The future scenes have zany architecture reminiscent of Tekkon Kinkreet. The sight of a fuedal castle turning into a battle robot is wacky and awesome at the same time. The movie drags on rather long, and ShinChan's juvenile humour never did make me laugh that much (then again, I am not the target audience) , but if you liked Castle of Cagliostro, or Samurai swordfights, check out this movie. You will be pleasantly surprised.